I felt a touch of regret this morning as I woke to discover that my abdomen had internalized the tension of the Arab/Israeli struggle. This probably surprises none of you who know me well, but I thought I’d last a bit longer than three days on the road before my body began to protest. Why must I regret such delicious food? I am extraordinarily touched by the great feedback on my posts so far, but regret not spending enough time at the Kotel to know that I should call it the Kotel, and not The Wall. 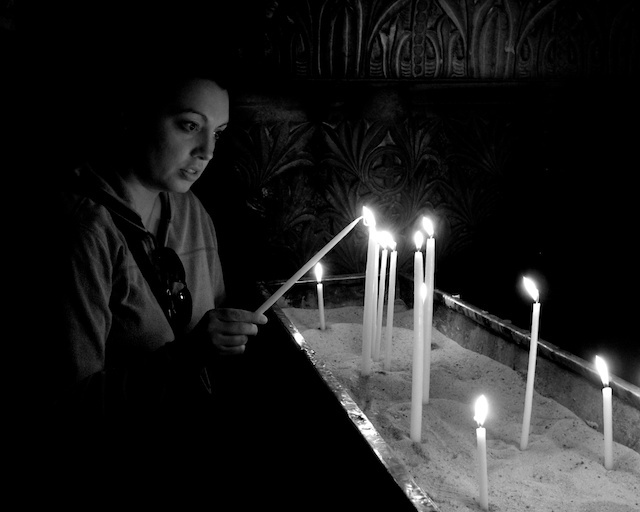 Jamie regretts shying away from the massive line and not actually entering Christ’s tomb at the Church of the Holy Sepulcher. Armed with Tums and liquids, we set out to right a few wrongs. We entered the Old City through the Jaffa Gate at about 7:30 for a brisk stroll through the Christian and Muslim Quarter. The smell of fresh baked breads and morning hookah wafted through the air, but the streets were devoid of most commerce as the vibrant stalls were all shuttered at this early hour. Children ran through the streets en route school starting our day off with youthful exuberance. 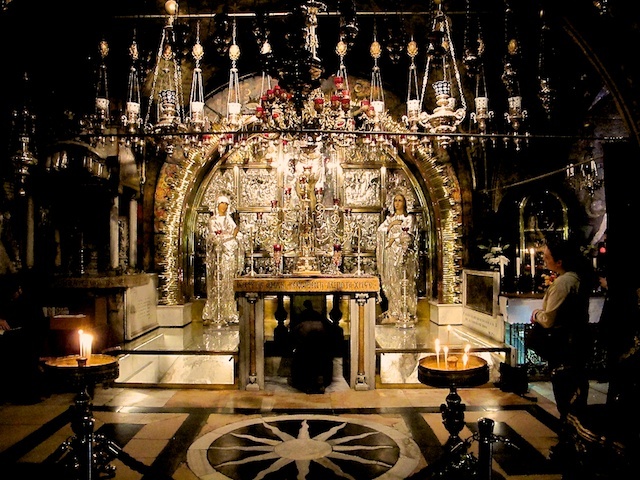 The Church was almost empty…except for one busload of Russian Tourists flooding the line to Christ’s Tomb. I decided to have a seat and sip my water. After, Jamie thanked me for returning with her and was glad for the experience. As we left, the line had miraculously disappeared and together we ducked down into the tomb. Just as we kneeled down for a moment, a Greek Orthodox Priest came in and yelled at us ‘time to go now, move on.’ Why am I scolded at every non-Jewish site? Apparently there was another woman in there who had overstayed her welcome and the next bus had just arrived. I wasn’t about to argue with an angry Priest though and smiled politely as we left. After, we went upstairs to the Golgatha [sp? 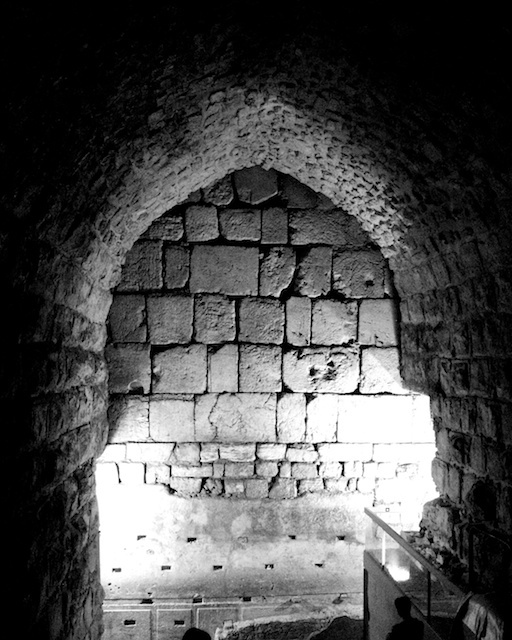 ], where it is believed Jesus hung on the cross. It was dark and beautiful. We each lit a candle. It is believed that Christ hung here on the cross. Then, it was back to the Kotel. Jamie found a place to relax and I went in, laid Tafillan at the Chabad booth and went inside to say my prayers. I had trouble finding someplace I could focus, which I require these days in order to read Hebrew. At best, I struggle. An old man was followed me around begging for spare change but calling it Tzedakah. I was about to leave when an older man with olive skin and silver hair, chanting at a beemah gestured for me to come over. 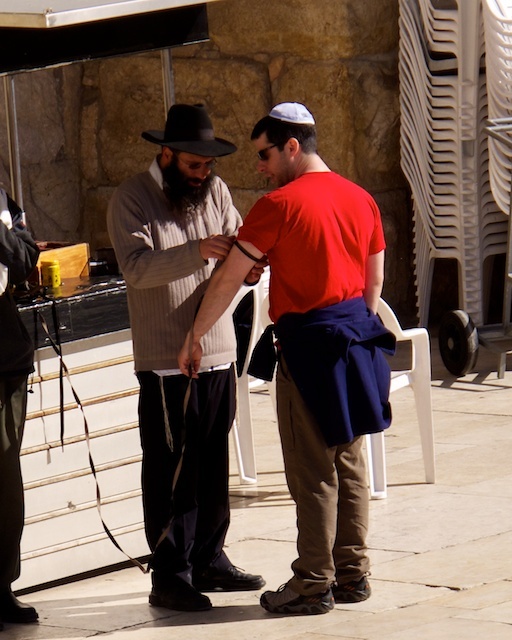 He placed a book in front of me, shocker–no English here, and then draped a Talis over my shoulders. This alone made me very happy. He was reciting the entire ceremony from memory and at an incredible pace. I don’t know how anyone could speak that fast. This man could’ve given any modern rapper a solid run for their money. Every few pages he’d move me to the right place and guide me along the page with his finger. Then he’d pound the table with his fist, while addressing the crowd and the Kotel. Standing there, at this makeshift Beemah with the warm morning sunlight washing over me, I was completely content. In life there are but few perfect moments, and here I’d found one. My stomach pain was no longer a factor. He recited Kaddish, then later the Shma and Ve’ahafta. Wow – two days in a row! 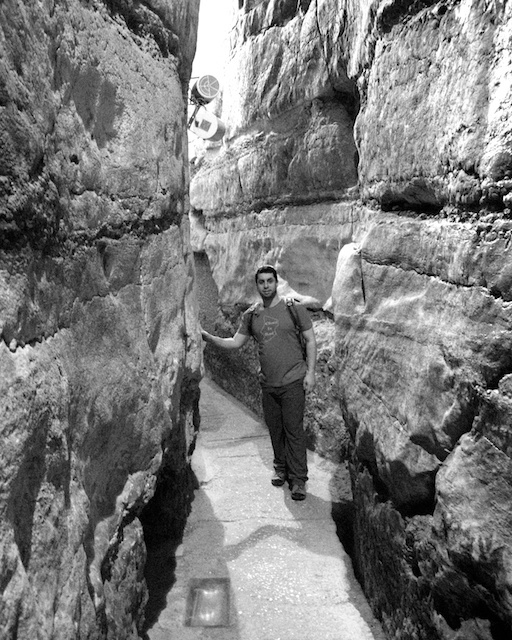 Upon advice from Miryam Seid [Thanks, Mir], who is now two for two, I investigated the Kotel Tunnel tour, which usually requires advanced reservation. It just so happened they had a few extra spots available in one of their English tours. With an hour to spare, we headed over to a wonderful outdoor cafe to make friends with fellow travelers. I was delighted by the free wi-fi, Jamie by the copiously caffeinated beverages. We returned for the tunnel tour and were completely blown away. The tunnels are active excavation sites and our incredible guide taught all about the Kotel; from how it was built, to why it is so important. In fact, most of the Kotel is buried, and only a small portion makes up what you see from the public plaza. The tour used incredible scale models to illustrate what this area looked like over the years and this fascinating lesson brought the history to life for us. Jamie will admit that she wasn’t exactly enthusiastic about this tour, when I booked it without really asking (when will I ever learn?) but it was a major win for her as well. 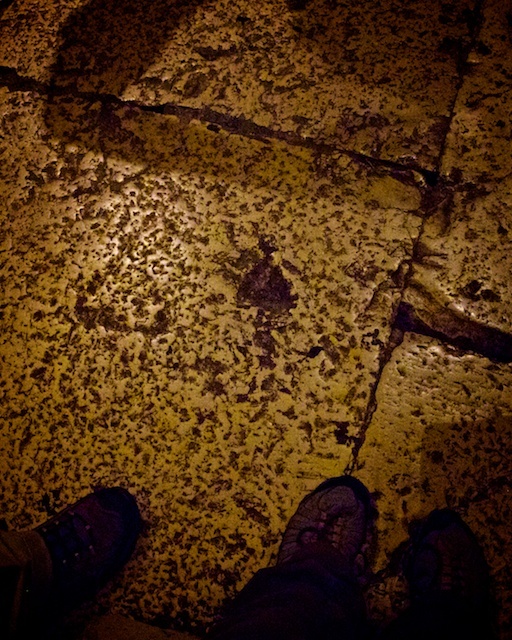 We even at one point stood on the very street that people walked on over 2000 years ago and saw the section of the wall the was closest to the Holiest of Holies. Beaming from ear to ear and hungry for lunch, we returned to the same place as yesterday for Falafel, then headed to the Dung Gate to hop in a cab. Thanks for your kind words and thanks for reading. We follow your lead with the world travel! Very moving Chad. You and Jamie are so fortunate to have this experience.